Vacation (and summer almost) over, back to the blog. Time for the third installment of the design series, in which I’ll cover the submission process. I’m certainly not an expert when it comes to this aspect of the business. I have had success and failure, both with the pattern featured in this series in fact. But I’ve answered calls for submission a few times now so I can pass on what I do know. Typically a company will put out a “Call for Submissions,” in which they detail what they are looking for in terms of color, yarns, themes, etc. If I have something in my “little book of ideas” that seems like it would be a good fit for the Call, I put together a submission. A submission is basically a one to two page showcase of your idea and how it would come to be. It should include, at minimum, a sketch of the idea, a swatch, suggested yarn(s) and a little blurb about the pertinent details of the design. It’s also helpful to include a schematic showing the dimensions of the piece, a bit about the construction, and short bio of the designer with some examples of previous work. So what are you hoping to gain by submitting a proposal to a yarn company, magazine, publisher, etc? Almost always you’ll get yarn support, that is, yarn provided to you at no cost, to knit the sample. Sometimes the company will provide editing, photography, layout and promotion, or any/all of the above. In return for your design and written pattern you may get paid a flat fee, royalties, or sometimes nothing at all, just the promise of “exposure”. Some deals are better than others and you must really weigh all your options and consider just what it is you’re looking for from the arrangement. Here is an example of a successful submission (with a few details removed.) One very similar to this was submitted to and rejected by Knit Now magazine. 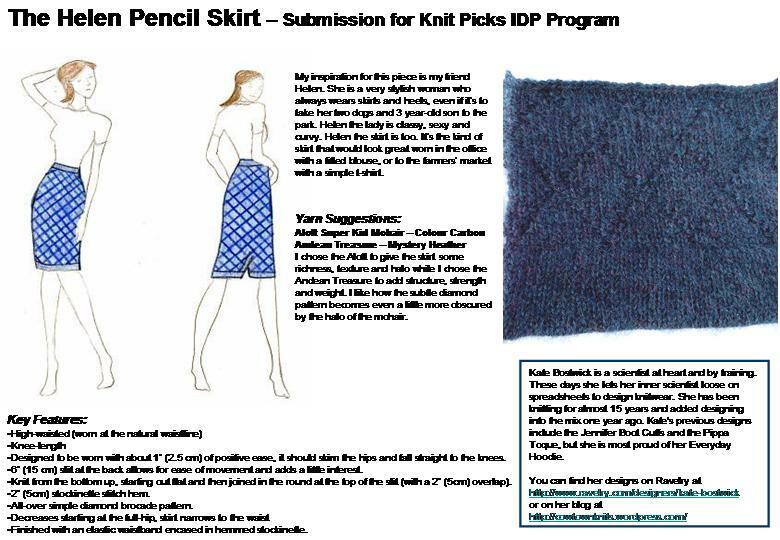 But, not accepting defeat, I modified it slightly to fit the format requested by Knit Picks and resubmitted the idea to them. This time I had success, and you should be seeing the new pattern within the next few weeks. That’s about it for this phase of the process, next up – Math and Grading!